Project portfolio management enables businesses to prioritise its initiatives, and undertake only those projects having greater value for the business. It also optimises resources in the organisation, reduces risks in planning & executing projects. If implemented properly and practiced regularly, project portfolio management can provide high value returns. In essence, PPM help management to focus its attention and efforts to balance project portfolio to achieve optimal performance and returns for the entire portfolio. These are incorrect ways to look at project portfolio management. Firstly, PPM tool is just a tool and it can not solve inherent problem in the organisation such as unclear project processes, undefined way of capturing project requirements, absence of risk assessment and response planning, etc. At best, PPM tool can be excellent enabler for project portfolio management, it can bring together project portfolio stakeholders, allow them collaborate, bring more transparency with automated communication, provide project portfolio information in more meaningful way, highlight early warning indicators, etc. Which factors are driving the business? How business managers are expecting PPM to drive projects to implement business strategies? ;so that the stakeholders involved in PPM implementation are well aware & more focused to deliver exactly what business expects to grow/expand/achieve instead of focusing on initiatives which can lead to sub-optional returns for the business. More often than not, companies start project selection based on budgeting and available funding. Managers usually makes the mistake of selecting projects based on situational conditions such as – when a project is highly pressed by client, sudden it becomes priority for the business. So project is picked up because it has high priority for that moment and it is allocated a budget from available funds. This goes on till company has completely utilised/exhausted its funds. The projects requested thereafter are simply pushed to back-burner or simply ignored. Do you see anything wrong with this approach? The project selection is guided by ad hoc priorities. The investment strategy is missing. Managers who fail to understand needs of various business units (BU) which could be short term, long term, medium term; it could be business as usual (BAU), new initiative or expansion strategy and rather focus on pressing things, contribute to failure of PPM and lead an ineffective implementation of business strategies. 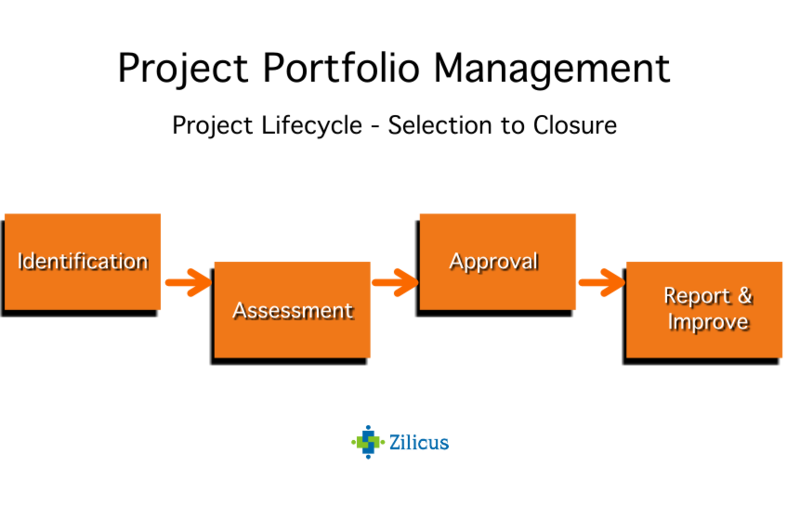 The process depicted above as assessment, is crucial for the overall success of the project portfolio management. Of course, there is more to success of PPM after project selection. Very large projects are complex, difficult to manage. Portfolio managers need to break large initiative into set of small sub-projects. Setting up teams per small project, giving them more clarity, autonomy, comfort works better than running a large complex project with overwhelmed team members. You don’t want to run too many projects and many of them remaining incomplete in the portfolio. It not only drags the portfolio in terms of cost, resources, timeline but also compromises on value being delivered to the business. The last thing you want to have projects in your portfolios which become irrelevant. So we are talking about achieving fine balance of having appropriate projects breakdown in your portfolio/program. Typically in large organisation, projects are selected and funded by project sponsors and in turn managed as a part of projects portfolio. Once are taken up for planning and execution, there are multiple ongoing projects in a portfolio. This is a typical mistake that we see : prioritisation of projects within a portfolio – there are no specific priorities assigned to projects. Teams keep working on average projects whereas crucial project is pushed back and starts derailing. As project is kicked-off, it is possible that during its lifetime, the priority may change once significant milestones are achieved or under-achieved. There has to be a clear communication and mandate from portfolio managers to project managers to project team members about project priorities and when priorities change. Clear communication and understanding saves everyone from significant struggle and pain. You can not have a successful PPM in absence of right governance framework to guide its processes and decisions. Just the way we think of project manager to follow project governance or mutual fund manager to follow governance while selecting stocks, bonds & other financial instrument to ensure right things are done at appropriate time. We will not invest in mutual fund or portfolio manager (PMS) who do not have any governance framework to follow or makes random decisions based on random justifications. In the same manner, portfolio manager selecting, prioritising, funding projects without any structured approach or governance guideline makes portfolio vulnerable to uncertainties and can lead to failure. Essentially, project portfolio manager is expected to exercise/follow governance framework while selecting, managing projects investments in the portfolio. Another topic that needs a special mention in portfolio governance is scope management. Though portfolio manager will not be able to get into nitty-gritty of tracking project scope but s/he should have a change management process in place to enforce new change request to get identified, submitted, reviewed approved/rejected and accordingly implemented. Scope creep is inevitable and it can turn bad only if not managed correctly. From project perspective, scope cree leads to project delay, more resources, more quality check, more cost and possibly low team morale. However from end user perspective, if scope changes are ignored can make project outcome: product/services ineffective or useless. Hence, scope creep is not entirely bad if you have appropriate change management process. Considering change management as a part of project governance along with other strong project management practices such as risk management, resource planning, cost tracking, quality management, etc can help you manage new change requests very effectively. What are goals & objectives of a portfolio and in turn a project? Will it bring desired benefits to end user if implement? Will it hamper desired outcome for end user, if not implemented? Is it critical to implement or can be ignored? Will implementing a given change request, impact timeline, cost? How? What is the impact on schedule, resources, quality, risks and cost? Do we need budget approval? Timeline approval? Who will approve these extension of budget, timeline, etc? Is client supposed to fund additionally for this change? History has the proof of project failure. If project manager lacks right estimation tools and techniques, it can lead to substandard project outcome (in other word, or harsh words – project failure). There are elements project managers tend to ignore while planning projects. Project resources are shared and unlike machine, people can not flip-flop mechanically; especially SMEs, highly skilled staffs are in demand from multiple projects and each project has different level of engagement, demand, complexity. It is prudent to consult these SMEs and understand correct efforts required, availability constraints before proposing project schedule. The biggest down side of wrong estimation is not only derailed project but also low employee morale. One project may fail, but if employee morale is impacted, it has cascaded effect on the portfolio of projects and company as a whole. Like any new initiative, if you are to implement project portfolio management in your company, you will need strong and decisive support from the CEO, CIO, CFO if not everyone in the top management. Why am I supposed to spend time and efforts learning this? Will it take away my job at some point in time? Why are you making it complicated to getting new resource to team? What is so great about this new tool/process? I am already loaded with my own targets, don’t want any new burden. I am not saying these questions are entirely wrong or employee thought process is flawed. It is perfectly natural in the REAL world we live. People are worried of changes, learning new things, job-insecurities. Implementing PPM can bring a sea-change to the way staff thinks and work. But when implementing PPM becomes necessary, for the greater good of the company. The PPM implementation team, champions will need backing and support from CEO, CIO and other management team to address concerns of staff, vendors; overcome their reluctance to embrace PPM and doing project work in new way. PPM is top-down initiative where it stems from the top management and trickles down to the staff members’ level. For a successful PPM implementation, top management has to extend and consistently signal unwavering support. For the implementation of PPM, you may need to create new roles, assign existing staff to these roles or hire new ones. You need to correctly know the skill set and experience required for each of those roles. PPM implementation is not limited to few set of people but it is an organisation wide exercise. You will not only need executioner but also messenger/evangelist to promote these initiatives. There are pilots to be run, case studies to be built, training to be imparted and so on. So essentially, you have to fire multiple engines at once to make it successful and you will need sensible pilots to drive the PPM’SHIP. No surprise here. Project portfolio implementation is not about using PPM software however PPM initiative has lot greater chances of success if organisation uses PPM tool. Portfolio managers have to make right decision. Right decisions can only be made if one has right information available. 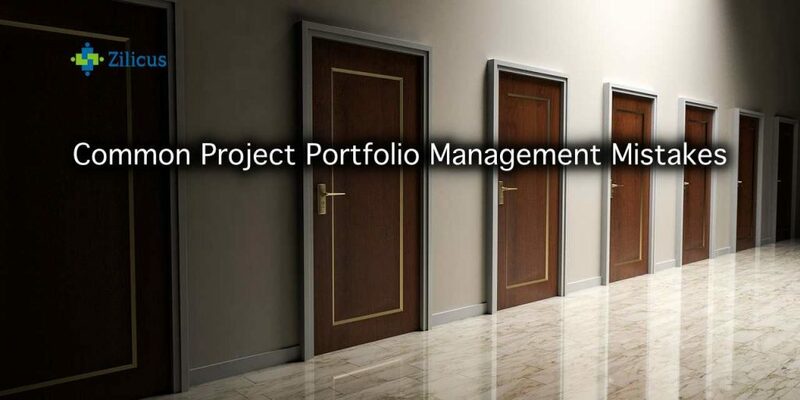 PPM software can give portfolio managers the information they need to make right decision of selecting project, prioritising project and controlling projects as well. PPM software not only displays portfolio status information using dashboard and reports but, it can enable and automate PPM processes. But for the discussion purpose, we will limit ourself to monitoring and reporting of PPM. To know whether set of projects in a given portfolio are on track or not, PPM software can provide visual information through portfolio dashboard and reports. Once you know the projects which are slipping the track, portfolio managers can investigate and assist/troubleshoot given project(s). Other project portfolio KPIs like earned value, etc. Having a right project portfolio management software is necessary. Portfolio managers need right information, highlighted at right time. This information can be gathered and presented in far easier way using PPM software. Portfolio managers can be more confident of their decisions if they can access real project information on time and act on time. To summarise, let’s look at the list of common mistakes in PPM implementation.